Can Shamu Become a Dolphin? She sits on the edge of the pool. Six years old. Apprehensive. No, petrified. Breathing much faster and extremely out of her comfort zone. The kids in the swim lesson happily jump into the water. And she does as she is told – barely. It’s a summer day. The sun is shining. It is a perfect day to learn how to comfortably bob under the water, blow bubbles and start on her way towards a life of water confidence and triathlons. Oh no, friends. Five minutes in, panic takes over. Tears. The pool deck seems much safer than the water and so does her Mom, watching from afar. Out she goes. And that.was.that. Fast-forward 35 years, some swim lessons and a triathlon later (finally!) She is still not feeling her groove. Looking to get this swim thing down PAT. Always beating herself up for not “getting it”. Everyone else in the pool seems to. What is the big, hairy deal? I’m sure, clever reader you have assumed by now this story is mine to tell. What happened next was so unexpected. It has stuck with me all week. 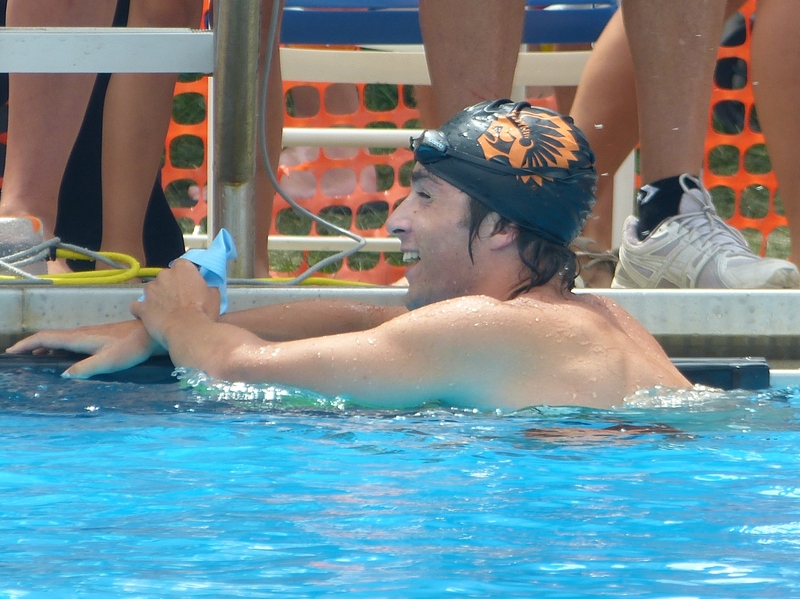 My cousin, Michael, competed as a swimmer for 13 years. He’s now in town and a Freshman in college. We got together last weekend and I begged him to get in the pool with me to give me some pointers and try to assist me with the ugliness that I call swimming. He in his lane and I in mine. I told him to do his thing and when he was done he could tell me how bad I stunk and give me a few suggestions. I set off on my zigzagging course. And he confidently shot off the pool wall like a bullet. I have watched him compete before and it is exciting and so impressive. Of course it is obvious by now how I revere a swimmer. So unnatural for me. So effortless for them. As I swam in my lane, what I saw under the water was simply incredible. Flawless. And who doesn’t appreciate flawless? He was so in his domain. He had compete mastery of his craft. It was beautiful. The phenomenal flip turns, launching way off the depths of the pool. The dolphin kicks. So aptly named. His movements imitated that of a dolphin. It was unreal. From my vantage point, unlike anything I had ever seen under water. Powerful, yet so smooth and graceful. It got me to thinking, had my Aunt -his Mom- ever had this view of her son in his element? Years and years of car pooling and early morning practices day after day. Hours and hours of sitting on bleachers patiently waiting for the gun to go off. Years of weekends filled with travel and wait. Travel and wait. For just a moment or two of watching him compete. She has such pride in her son. He had such drive and motivation for his sport. I called her up and encouraged her to dust off her swimsuit and make it a bucket list item that just has to be checked off soon. It’s not something I think she should miss. How rare and how amazing to find that special something that is a natural extension of yourself. What you were called to do. The thread of who you are. We all know it when we see it. Basketball and Michael Jordan. Shaun White and snow boarding. Meryl Streep and acting. 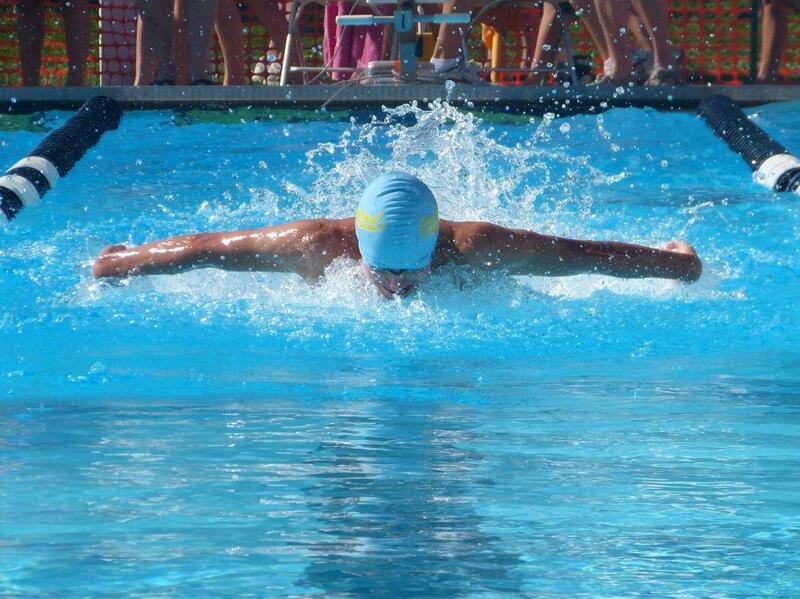 This is swimming for Michael. The icing on the cake when it is your kid to cheer on and marvel at. Sadly, I am no dolphin. I will never master a flip turn (or even attempt one!) But I felt so very lucky to be in the lane next to this guy. It was a rush. Born to do it. Just wish I had that grin and ease on the pool deck before I jumped in the water 35 years ago. Clearly I am scarred for life.